Cheston Holt was fishing near Waianae on the island of Oahu when he made his historic capture. He was fishing with a 13-foot Nitro pole, a Penn 4/0 reel and 60-lb test Ande line. Here's the story in his words: "June 25, 2009 was the first time using my new Nitro pole that I got from my girlfriend for Father's Day. 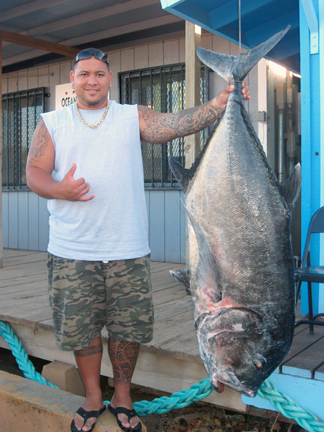 While baitcasting on the west side of O'ahu I hooked a 127.6-lb ulua. "Special mahalo to Leighton (Kaika) Coast, Alan Holt, all the gaff men (you know who you are), Dutch and Richard. "Something that I thought was cool was that in the mouth of this ulua was an old rusty hook and fishing line in his throat that had limu growing on it. He got away once before but not this time."